Before I start this week's post, I'd like to have a moment's silence for beloved TV, 'Ruby', who tragically passed away this week, aged 20. Though Ruby has now been replaced with a younger, slimmer model, she will always have a place in my affections. Over the years, I've watched many a movie, TV show and football match on that set, and it was only due to the fact that she was making a worrying burning sound that I was forced to move on to newer, sharper pastures. Ruby - 1991 - 2011 RIP. This week's reviews start with not a bang, but a whimper; Final Destination 2 is the worst movie I've seen since watching Birdemic earlier this summer. Of course, it's nowhere near as terrible as that abomination - the cinematography and sound mixing is professional, for one thing - but as a follow up to a film I really enjoyed when it came out in 2000, it's a big step down. The set up for FD2 is very similar to its predecessor - the central character has a premonition that she and her friends are about to die in a motorway pile up. As she freaks out, she blocks off a number of other motorists on the slip road, and inadvertently saves their lives when the aforementioned pile up takes place minutes later. Of course, Death isn't about to take this lying down, and starts bumping off the would be victims in a series of bizarre 'accidents'. Now, while this was basically the premise for the first movie, it all seemed to make much more sense the first time around. For some reason, they've tinkered with that underlying premise - now Death has decided to make a list of the order in which those involved in the crash would have died, and work backwards. Tony Todd (better known as the Candyman), turns up for a brief scene in which he mumbles something about babies being born offering a loophole to 'Death's grand design'. Apparently the fact that he works in a mortuary gives him personal insight into the inner workings of the mind of the Grim Reaper. One of the film's biggest failings is that there are so many potential victims in this film that there's barely time to get even the vaguest outline of them as characters - meaning that you really don't care whether they make it or not. The acting performances in this movie are generally poor, with Ali 'MDF' Larter particularly culpable. The only enjoyment to be gleaned from this film is in the elaborate death scenes, and to be fair, they are generally inventive and well executed; particularly the initial motorway crash sequence and a scene in which one of the characters is chopped into three pieces by a flying fence. Other than that, though, marking this film on the Edna Krabappel scale, I would have to say 'very poor, even for you'. In which Ryan Reynolds plays Paul Conroy, a contractor working in Iraq who wakes to find himself buried in a coffin, with only a mobile phone, lighter and pen for company. He must use his wits and resources to get up out of his grave, before time - and air - runs out. This movie plays out like an alternative version of Kill Bill vol. 2, one where Uma Thurman never learned the five point palm exploding heart technique, so was forced to rely on more conventional methods to escape from her predicament... From the first minute until the very end of film, we spend all our time in the coffin with Paul, as he makes increasingly desparate phone calls to his wife, boss and the US State Department. It's a testament to an engaging script and to the acting of Ryan Reynolds (who I hadn't rated particularly highly before) that this scenario works as well as it does, though it did take me a little time to get used to the fact that every scene in the film was going to be set in exactly the same location. (Pedant's corner - I did notice a bit of a plothole in this film - if the kidnapper was so keen on Paul using the phone to make videos of himself, why was he bound and gagged when he first awoke in the grave?) A suitably gripping thriller, but probably not one for claustrophobic viewers. I watched this movie to see how my new TV would handle a big blockbuster movie with plenty of special effects. Both the movie and TV passed with flying colours, though to be honest, having already seen TDK three times, that was no surprise - I was well aware of how good it was. Christopher Nolan takes this instalment of the Batman series into very dark territory, pitting Christian Bale's morally troubled hero against that wildly unpredictable 'agent of chaos', the Joker. The Dark Knight works so well for a number of reasons - some excellent acting from a very strong cast (particularly from Heath Ledger), an interesting storyline, fantastic special effects (relying on real life stunts rather than CGI) and a wonderfully dark and moody atmosphere. Roll on next year when The Dark Knight Rises comes around; let's hope it can buck the trend of the Superman, Spiderman, The Godfather and Scream movies and deliver a worthy third entry in the series. 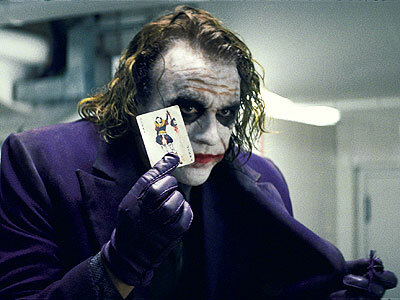 As I may have noted here before, for my money The Dark Knight is probably the best superhero film of all time. This was one of those cases where I'd built a movie up in my mind so much that it couldn't possibly live up to expectations. Having seen so many strong reviews (particularly from US critics), I was expecting something absolutely sensational, and what I got was 'just' a very well made, stylish crime picture. Ryan Gosling plays the unnamed protagonist, a taciturn, thoughtful man in his late '20s who works by day as a mechanic and stunt driver for the movies, and by night as a getaway driver for hire. After the driver assists in a heist which goes wrong, he and his friends find themselves pursued by a pair of mid-level Jewish gangsters (Albert Brooks and Ron Perlman, both excellent).We never really find out too much about the driver's past, but it becomes apparent during the course of the movie that as well as being an accomplished wheelman, he is also an individual with the capacity for extremely violent acts if he or his loved ones are threatened. The loved ones in question are Irene ( played by Carey Mulligan, as delightful as ever) and her young son, neighbours who the driver begins to care for. If I was to be overly critical, I would say that the film is a little slow paced at times, but some breathtaking car chases and bloodcurdling brutal displays of violence more than make up for those quiet moments. Nicholas Winding Refn directs with great panache, with some beautiful overhead shots of unheralded parts of greater LA. This may not have been the absolute classic I was expecting, but was certainly an entertainingly visceral experience.